Garth Brooks took another step into the digital age Monday with his announcement that his new album Gunslinger, will be released exclusively* through Napster. "We're excited to be able to get our music out there to the young people in a way they're more familiar with" stated a jovial Brooks at the press conference. "*We'll still have the music on GhostTunes, but we're diversifying our rollout a bit this time. It'll be more accessible for the kids on a cool, fresh "app" that they're already using." "Letting youngsters 'steal' our music on Napster will give it more of an edge and make them feel a part of an underground movement," Brooks continued. Whether Brooks and his management have actual knowledge of Napster's modern operation as a modestly used legal streaming service or not was unclear, but it seemed unlikely. Brooks has been slow to embrace technological advancements in the music industry, only allowing his catalogue to be sold digitally online in recent years. "We make our money on the concerts and t-shirts anyway, so what's a little 'theft' to get our songs out there?" Brooks went on, still seemingly unaware that Napster is not a clandestine or popular service in 2016. 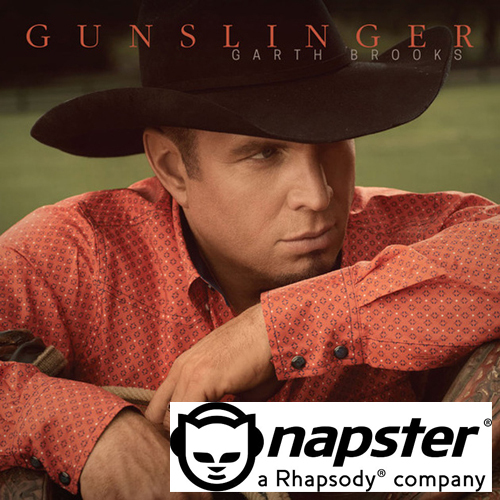 Brooks went on to announce that the second single from Gunslinger will be released on Hitclips, on three separate discs that can be procured by sending in three proofs of purchase from Oreo O's cereal.